When Cassidy begins painting her visions, she has no idea that she actually opens a door to the past. And behind that door are ghosts, ghosts that want to be seen and remembered. 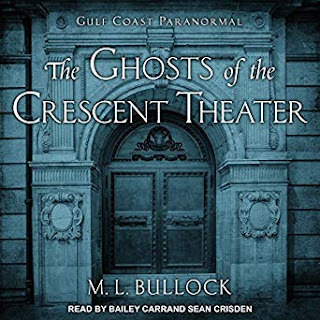 As the rookie member of the Gulf Coast Paranormal investigation team, Cassidy is eager to prove she has the skills required to make the cut, but will her eagerness to fit in place the team in supernatural danger? When a new client hires GCP to settle the spirits in the Crescent Theater, Midas, Sierra, Joshua and Cassidy are put to the test. Will a century-old tragedy force the new owner to shutter the doors forever? This book is a bit different than the other two in that the ghost that the Gulf Coast Paranormal team is investigating isn't so much looking for closure but for their moment to shine and she is a bit more vicious. After Cassidy accidentally paints a mural of the Crescent theater on her friends wall in a blacked out haze she finds the ghost is also haunting the painting and her friend who bears a striking resemblance tot he long dead actress. Again not the best writing but an interesting story and interesting characters. I'm not sure what it is that keeps me from loving these books but they are entertaining and keep me coming back. There are several more in the series so I look forward to seeing how the characters develop.